t Abundance we encourage you to relax and enjoy the wonder of nature that surrounds you. Spring-fed Cypress Creek is located in the back of the property and is always flowing. 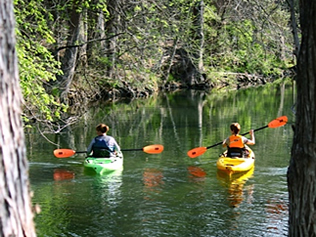 We provide kayaks to watch the fish, turtles and birds, and to explore the sparkling creek. There are a variety of floats as well as outdoor games, all for your enjoyment. Binoculars and bird and wildlife books are also available to help you explore and discover the wonder of Abundance. Abundance has everything you need and more. From the delightful such as comfy robes and fun books, to the more practical like flashlights, sunscreen, outdoor towels, and mosquito spray, almost anything you could think of is at your disposal. No car, no worries. 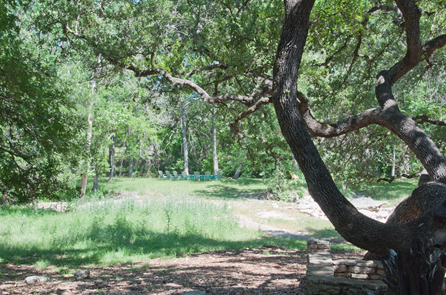 Abundance is located just an easy walk from the downtown Wimberley Square. Steeped in history, the Wimberley Square is famous for its antique shops, art galleries, restaurants and live music. You can leave your car and your worries behind as you explore the best that Wimberley has to offer on foot.